乌兰图雅, 高娃, 殷旭红, 曹民治, 郭生春, 王强, 阿日奔吉日嘎拉, 刘美琴. 内蒙古自治区巴彦淖尔地区鼠类携带疏螺旋体调查研究[J]. 中国媒介生物学及控制杂志, 2018, 29(3): 239-241. Wulantuya, Gaowa, YIN Xu-hong, CAO Min-zhi, GUO Sheng-chun, WANG Qiang, Arionjergal, LIU Mei-qin. 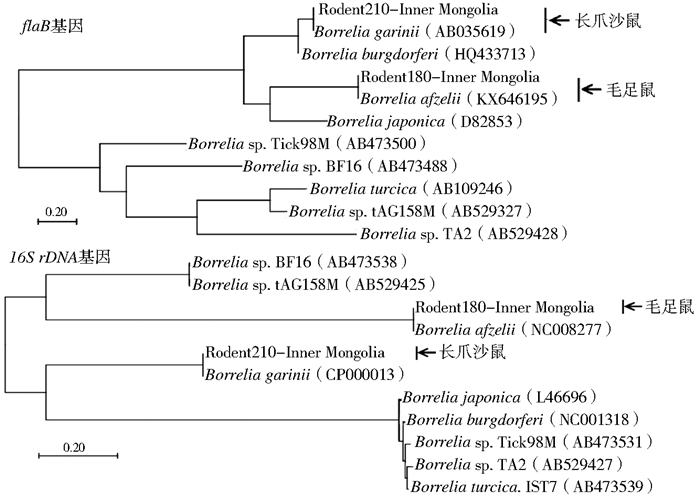 Survey on Borrelia bacteria in rodents from Bayannur, Inner Mongolia Autonomous Region, China[J]. Chin J Vector Biol & Control, 2018, 29(3): 239-241. Corresponding author: Gaowa, Email: melody_gaowa@yahoo.com. Abstract: Objective To examine the infection rate and genotype of Borrelia sp. among rodents, we surveyed rodent samples from Bayannur region of Inner Mongolia Autonomous Region, and to provide basic information of epidemic prevention and risk assessment for local area. Methods During 2015-2016, rodent samples were collected in Bayannur region by the trap-night method, and rodent spleen DNA samples were examined using specific PCR to detect the Borrelia sp. Results A total of 480 rodents were collected from Bayannur, and Meriones meridianus accounted for 174, and M. unguiculatus 124. The results showed that both were the predominant species in these areas. Borrelia sp. were identified from 8 (1.67%)when amplified by PCR targeting flaB gene and 16S rDNA, including 6 cases of M. unguiculatus and 2 cases of Phodopus sungorus, the positive rate were 7.14% and 4.84%, respectively. Sequence analysis of the amplification products showed identification of B. garinii and B. afzelii with 100% homology, respectively. Conclusion In this study, we confirmed the B. garinii and B. afzelii were main pathogens transmitting among rodents in Bayannur region, it is necessary to implement monitoring and prevention of Lyme diseases. 马广鹏, 孙传范, 赵娜, 等. 中国蜱传病主要流行趋势及防控科技对策[J]. 中国农业科技导报, 2011, 13(2): 105-109. 张哲夫, 万康林, 张金声, 等. 我国莱姆病的流行病学和病原学研究[J]. 中华流行病学杂志, 1997, 18(1): 8-11. 逄春积, 邵冠男, 朱纪章. 蜱传性回归热传染媒介的调查研究[J]. 人民军医, 1960(增刊2): 47-52. 刘吉起, 赵奇, 许汴利, 等. 蜱类研究进展[J]. 中国媒介生物学及控制杂志, 2013, 24(2): 186-188. 吕燕宁, 李良辰, 窦相峰, 等. 2013年北京地区小兽中3种病原携带状况调查[J]. 中国媒介生物学及控制杂志, 2016, 27(4): 336-340.